All registered trademarks, and all frequently misappropriated. I honestly don’t know if John Styll ever cringed when he saw the name of the magazine he started 30 years ago used as a catch-all descriptor for a certain segment of the music industry. And where those aforementioned brands have been able to employ high-dollar representatives to actively defend the proper usage of their names, Styll and his associates frequently just had to look the other way when the magazine’s name was misused in other media forms, occasionally as a pejorative. But the undeniable fact is this…from CCM Magazine's humble newsprint beginnings in Southern California grew a prism through which a billion-dollar industry was viewed, thousands of artists were profiled, and countless lives were impacted. And now that magazine is gone. Sure, the current stewards of the trademark (to whom Styll and his former partners sold the magazine in 1999) vow to keep CCM Magazine’s legacy alive through an online-only presence. But that same company has other, similar properties in that space, and will they truly devote the resources necessary to maintain the brand’s impact in this new scattershot media age? Time will tell. 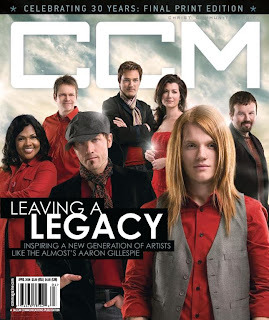 Each of those artists, and every other music maker whose triumphs and tragedies were chronicled in CCM Magazine’s pages owe Styll and the writers, editors, designers, photographers, ad sales people, marketing folks (and yes, web developers) who followed a debt of gratitude. Why? Because it’s a tough job to successfully and compassionately comment on others’ creative works, and a tougher job still when that creative work deals with matters of faith. For me, the final printed edition of CCM is bittersweet because it’s the first publication for which my byline appeared and from which I received a paycheck. I was in my “ill-fated year of grad school” in Texas, and I wrote a multi-page feature on various bass players plying their trade within Christian music. The thrill of taking that issue out of the mailbox and realizing that my work was contained in those pages remains with me today. A generation of writers and editors got that same initial thrill through CCM’s existence. Many of those people remain close friends of mine to this day and have done great work for a variety of different endeavors. This is where the Christian music fan will suffer, in the not having dedicated and talented music journalists ready to sift through the miasma of products out there, ready to shine a light on those artists and that music worthy of attention. Yes, that means there had to be determinations made, judgments passed and consequences faced. Those listed on the magazine’s masthead (fancy publishing industry term for the people on staff, FYI) took on those challenges willingly, professionally and with a sense of purpose and grace. The gatekeeping function of CCM Magazine (and most other music-only publications, really) is gone now, left to the free-for-all nature of the Internet. That reality, while occasionally exciting, is also quite scary. Because here’s the real secret behind working at any sort of music publication: We listen to a bunch of crap. Mainly so you won’t have to. That layer of protection has been removed, and people are pretty much left to fend for themselves. It also means that some of the really good stuff, music that frequently flies under the radar, is left to try to find a place as well. The simplistic theory is that if music is good, it will rise to the top and succeed. But even in the Internet age, success means finding exposure through as many credible, impactful avenues as possible, and the 800-pound gorilla of Christian music journalism has just been silenced. And it won’t be replaced. You can always find a new and better photocopier, a faster and more colorful flying disc, a softer and more absorbent facial tissue. But there will never be another CCM Magazine.